At the end of July I had made 33 baked items out of a plan to make 52 during 2013. This is where the plan started to fall apart. We had a nice summer and I was busy trying to make jam. 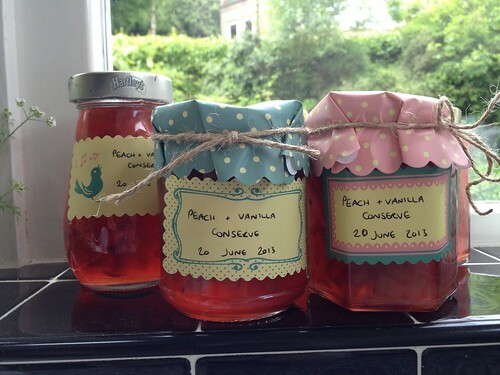 The Peach & Vanilla Jam was the first lot. I threw in a sachet of pectin out of the back of cupboard but it didn’t quite set right. Then I made some Strawberry & Vanilla Jam and I tried to do without pectin, but couldn’t manage it, Darren ended up getting me a bottle of liquid pectin that I’d never seen before from the local supermarket and I got it to set eventually. This was really yummilicious jam. Then I started reading up on how to get jam to set without using added pectin and decided it was a skill I needed to learn. I began with some Redcurrant & Raspberry Jelly, ok, but not great. I tried some Cherry Jam which I thought had reached a setting point but after I had jarred it up it was still liquid. Several days later I reboiled it and ended up with Cherry Toffee. Very nice, but not quite what I was after. I forget how many other variations I tried, there were several more, and none were really a success. Next year I will be using pectin again! August was also the time when the stars managed to align so that I finally managed to get rid of the crappy fridge-freezer than had been haunting me for six years and get a shiny new silver appliance into my kitchen. This gave me spare freezer space – actual COLD freezer space for the first time in a long time. I celebrated by splashing out on the ice cream maker attachement for my Kenwood Chef, and have been making ice creams and sorbets regularly since. Coconut, pistachio, lemon sorbet, lemon ice cream, blackberry sorbet, choc mint chip (yes, dark choc ice cream with peppermint chips), and plain old vanilla which isn’t at all plain. That’s just the ones I can remember off the top of my head. I’ve made lots of different types of ice cream now and am still experimenting – but the egg custard vanilla one remains the one to beat. So, baking still on 33/52 at the end of August. But plenty of other treats were coming out of the kitchen at the time!